The road to the Rose Bowl Stadium twists through the suburban Pasadena corridor. Small Rose Bowl signs dot the roads leading to the historic structure. The main road east of the stadium winds around a sweeping turn and then [pause] the view opens up. Tucked in a valley surrounded by the San Gabriel Mountains, the iconic football temple sits, reverently. It is striking against the mountain canvas. I’ve been a college football fan my entire life. I prefer it to any other sport, college or professional. I love the sound and colors, the pageantry of it all. The sound of rhythmic percussion layered beneath screaming fans, chanting cheerleaders, whistle stops, and pad pops is my favorite fall album. I listen on repeat. Saturday, the Rose Bowl dazzled — the colors were a feast for the eyes. The blue sky and yellow sun mirrored UCLA’s blues and yellows, which combined with red roses, red-faced spectators, of course, the glints of red on UC’s mostly-white uniforms. Like curtains, mountains draped the perimeter of the stadium as far as the eye can see. Walking on the field, I felt small. I recalled mornings in my childhood basement, sun peaking through the blinds as the Tournament of Roses parade occupied my television. I thought of iconic games played on that grass, Keith Jackson’s effusive — “the granddaddy of them all” — ringing in my ears. Heading into Saturday, I heard all the cynics, too. Outmatched. Outclassed. Too young. Stage was bigger than this team. Chip Kelly’s football IQ. UC’s program in decline. Yup, got it. While I listened to certain doubters, I wasn’t buying their certainty. Don’t get me wrong, I had my doubts. As I watched the team practice at Camp Higher Ground this August, I was mostly perplexed. I’m not someone taken by slogans or football aphorisms. Discipline? Organization? Methodical preparation? Intensity? I am taken by those. At times, I heard Luke Fickell’s voice boom as he chastised the team (and coaches) during transitions in practices. Gathering on the 10 yard line, I heard him undiplomatically cross examine whether the team wanted to compete…during every drill and every practice period. If they weren’t interested, he had some ideas. Fickell then laid into the other coaches for dragging around the field with no energy. But I heard Fickell boom last season. Why would this season be different? At practices, I did observe a lot of young talent — the newest class of recruits is big. And last year’s recruits were a talented bunch. Some skilled veterans remained, especially on the defensive front. Still, I couldn’t tell how they were blending or whether Fickell’s attention to energy, body language, and effort were making a difference. 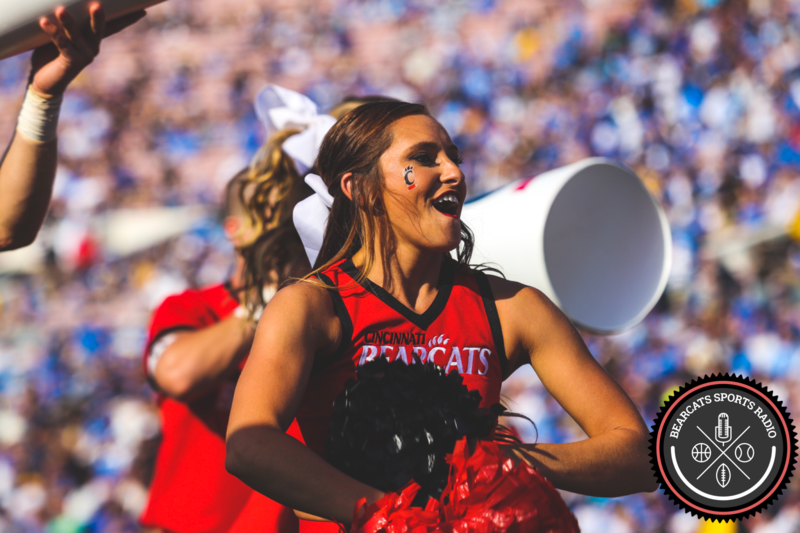 Entering Saturday, the so-called experts at ESPN were not high on the Bearcats’ chance of beating UCLA. To cover Vegas’ spread, UC just needed to lose by less than 15 points. Body language and energy notwithstanding, no one was bullish on the Bearcats. Even among the fan base, few thought a victory possible, let alone likely. Given the precipitous rise and decline in UC’s success over the last decade, many suffer from whiplash. Or maybe it’s PTSD. Like kids raised during the Great Depression, we cling to low expectations to avoid traumatic disappointment. As for me, I thought we could win if we didn’t bury ourselves with mistakes in the first quarter, and we fed Michael Warren II the ball. I thought it equally possible we’d get boat-raced in primetime on ESPN. Then, the damndest thing happened. We fought back, all the way back. We didn’t quit. Anchored by the defensive front (and Cortez Broughton’s 2.5 sacks), Michael Warren II’s herculean effort (35 carries for 142 yards), and RS Freshman QB Desmond Ridder’s game management, the Bearcats stunned a national audience. And me. And probably you. I’m not sure exactly when or why I teared up, but watching everyone celebrate hit me right in the chest. Chin quivering. Look, I understand it’s only the first game of the season. Don’t get carried away, Brian, you think. But there we were, on a patch of Pasadena grass, encircled by mountains and decades of college football tradition. Regardless of age, all of us — “thy loyal children” of the University of Cincinnati — celebrating what felt like a program tipping point. I was undone. What a great day to be a Bearcat! Next up, the Miami RedHawks. The Victory Bell. More tradition.